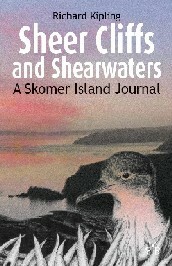 The author explores the natural history of Skomer Island and provides a personal reflection on life and work of a beautiful and remote seabird colony off the West Wales coast. 1st: Sunday, and again there were more eggs at Wick Corner and Bull Hole. Around lunchtime I met Sarah and Chris, perched on the rocky outcrop near the path to my hide. They were surveying the colony of ‘Lessers’ on the opposite side of the gully that widens out to Bull Hole cliffs. The gulls nest on the ground, dotted amongst the Bluebells and Red Campion, their seaside-white heads and bright beaks contrasting with the green, pink and blue of vegetation. They do not appear to be concerned by the bamboo canes that mark out a grid across the colony, allowing the surveyor, situated at some high vantage point, to map nest sites in relation to these markers. Nests and their contents are recorded to be checked again for large chicks later in the season. 1st: I spent the morning searching the rocky outcrops of North Wick ridge for ‘Greater’ chicks with Chris, finding vantage points from which to view the open, slanting hill tops under a hot sun. We had some success and a good tour of the south of the island; despite the recent rain, South Pond is dry, a bed of rusty-flowered Common Sorrel, with the ‘Lessers’ scattered amongst the vegetation watching over their young. After lunch I continued surveying the northern part of the island alone. Scanning Marble Rocks for chicks, it was striking to see the crag and Bracken-covered country set against the backdrop of super-tankers shimmering in the afternoon heat, the northern peninsular of St David’s forming a crooked line behind them. With most of the island covered, I met Jess at North Haven for a refreshing swim; the water seemed a little warmer, though not quite Mediterranean yet! Around eight, I wandered up to the Garland Stone before Bird Log, meeting Sarah in North Valley. She pointed out a couple of Linnets perched in a clump of Brambles; red-breasted finches that chatter to each other as they fly in exuberant flocks across the island; she said they reminded her of small Kestrels in their colouring. Although I found no porpoises at the Garland Stone, I enjoyed watching the Gannets circling low over the waves. In the distance the Dale Princess was out on the bay close to a tanker (she is sometimes employed taking supplies to the ships), dwarfed by its massive hull. The contrast in size reminded me just how huge these now-familiar ships are, how big the business of oil production and transport is, how, beside it, our own lives are as tiny as the Dale Princess out on the sea under the bows of the tankers. 3rd - 6th: Over the last couple of days I have completed the Fulmar and ‘Greater’ surveys, finally rounding off my fieldwork for the season and leaving the coming week to write up my end of season reports. It was hot and sunny as I toured the Fulmar sites on Friday. At Tom’s House there were no large chicks at all, but there were only a handful of sites on the fissured basalt face to begin with. Round the Basin the birds have fared better, with several sites filled by soft grey, wide chicks, apparently more solid than those of the Shearwaters, with small heads and scrawny necks protruding from their downy bodies. In the heat many sat open-beaked, sometimes moving their heads back to hack out their squawking call, some alone, others with an adult sitting a foot or two away, unmoving in the midday sun. ...I found that having picked it up, I found it very difficult to put this book down. As the author guided me from week to week and season to season, I could close my eyes and hear the raucous mewing of the gulls and the constant smell of salt in the air. For those who have previously visited Skomer, this book will transport you back to that special place; for those who have never been but are intending to go, it will act as a delicious appetiser for the main course to come. It's a fascinating read and highly recommended.